In September 1789, Washington, the newly elected first President, tapped his former aide to be first Secretary of the Treasury. Hamilton consolidated America's debts and paid them fairly, established a modern financial system, and argued for an economy that included manufacturing as well as farming. He also cautioned America against supporting the French Revolution. These policies won him the enmity of his former ally, Madison, and of Thomas Jefferson. After retiring in 1795, he continued to advise Washington. Hamilton found the administration of John Adams, however, a web of scandal, negligence, and threats of war. Hamilton, in his position as first Secretary of the Treasury, took a nation that was mired in debt and gave it one of the world�s first modern financial systems. 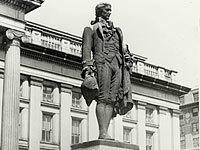 1789 Hamilton is appointed the nation's first Secretary of the Treasury. Washington is elected the first President. In Paris, the Bastille falls. The French Revolution begins. 1790 Hamilton writes his "First Report on the Public Credit" and his "Report on a National Bank." 1791 He writes "Report on the Establishment of a Mint" and "Report on Manufactures." He begins an affair with Maria Reynolds, a blackmailer. Thomas Jefferson and James Madison form a political party, the Republicans, to oppose Hamilton. 1792 Louis XVI is deposed, Lafayette flees France. 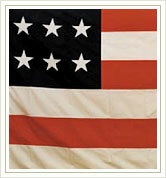 1793 Washington proclaims American neutrality in European wars. Citizen Genêt arrives in the United States. 1794 Hamilton helps suppress the Whiskey Rebellion. John Jay is sent to Britain to negotiate a treaty settling unresolved issues of the American Revolution. 1795 Jay's Treaty is signed. Hamilton resigns as Treasury Secretary. 1796 He helps draft Washington's Farewell Address. 1797 Hamilton writes Observations on Certain Documents, publicly admitting his affair with Maria Reynolds. John Adams is inaugurated as the second President. 1798 Hamilton is appointed a major general in the U.S. Army. The Quasi-War with France begins. Congress passes the Alien and Sedition Acts. 1799 Hamilton urges prosecution of The Argus for libel. Adams sends peace commissioners to France. 1800 Alexander Hamilton disbands the army at Congress's direction. He writes the "Letter . . . Concerning the Public Conduct and Character of John Adams, Esq . . . ," an attack on the President.